When Claudette des Oeillets first meets the young girl Mademoiselle de Tonnay-Charente, who will in future be known as Athenais de Montespan, it is a chance encounter. 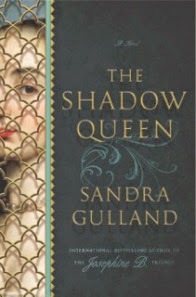 After all Claudette is from a poor travelling theatre family, trying their best to get by in 17th century France and Athenais is the girl who in due course will become 'The Shadow Queen', mistress to Louis XIV of France. Claudette is forced to grow up quickly, taking responsibility for her mother who barely seems to be able to hold it together unless she is on stage performing where she is exceptional, and also for her brother Gaston who is disabled. Whilst her mother is onstage performing plays by the most notable playwrights of the day, Claudette does anything and everything that she can to bring in a few extra sous to help make ends meet from cleaning and sewing to the occasional small onstage part. Claudette's story provides the viewer with ringside seats in the volatile world of French theatre, a world peopled by playwrights like Racine, Corneille and Moliere, the actors and actresses as well as all the fans from all walks of life. I found much of the theatre aspect of the book very interesting, mainly because I don't remember reading a lot about the complex political and religious implications of theatre at this point of time. I was surprised by how badly any one associated with the theatre were treated by the church of the time - not allowed to enter the church or have communion and therefore if they died without renouncing the theatre unable to be buried in holy ground. And yes, despite these efforts to ostracise the performers and their families, there were still many actors and actresses who attracted many fanatics (from where we get some of our modern concepts of fandom), even from among the aristocracy. It is an interesting dichotomy. Claudette's life changes immeasurably when she moves from the theatre world to the court of Louis XIV after she is appointed as the personal attendant and confidante to Athenais de Montespan, wife to a nobleman, mother of his children who live with him in another country but more importantly mistress to the king, and mother of his children. Athenais is desperate to protect her place as the king's main squeeze, resorting to charms and potions to keep his attention from wandering too far away and Claudette is a key player in helping her with this objective. This ends up with Claudette being caught up in the Affair of the Poisons which rocked the royal court of the day. I think that the publishers and marketers missed the mark with this book in a way. Firstly, in relation to the title, I must confess I am not 100% sure of the logic behind giving a book a title that actually doesn't relate to the main character. Sure, Athenais is the shadow queen but the reality is that the book is not about Athenais. It is about Claudette. Yes, for a large portion of the book Athenais is pretty much Claudette's main focus but as a title it didn't work that well for me. The same could be said of the synopsis. Yes, all the things that are mentioned in the synopsis did happen but I was a little disappointed by how little depth there was when it came to some of those events. For example, in the synopsis it talks about the "increasingly uneasy relationship between two strong-willed women whose actions could shape the future of France". Whilst there was a confrontation I don't think I got the increasingly uneasy vibe let alone anything more. And if you google Claudette's name you will find that she was (in)famous for one thing and yet that was mainly inferred rather than explored and how that all came about felt a bit odd to be honest! It is a bit disappointing to feel this way about this book, especially seeing as I did find many things in it interesting. I was a big fan of the Josephine B trilogy, and I liked Mistress of the Sun (just not quite as much) and as such I got excited when I learned that the author had a new book out. I think that will probably be still true for her next book but I do wonder how high I should set my expectations. Of course, maybe my reaction is tempered by the fact that in addition to not doing any blogging I haven't been reading much at all. Maybe this is just as much about me as it was about the book.